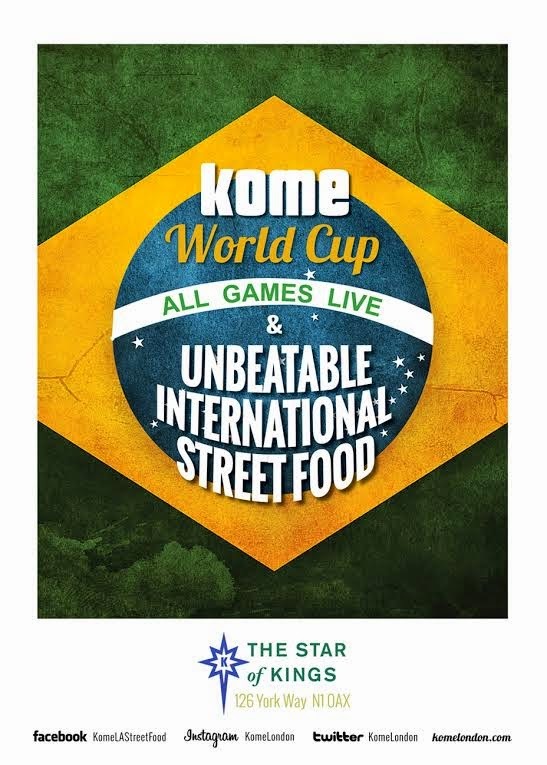 Kome LA Street Food's residency at Star of Kings in Kings Cross takes on a new twist as the World Cup approaches. During the tournament Kome will be doing daily specials based on one of the teams playing that day. E.g. they’ll be doing Acarajé (a beach snack from the state of Bahia) when Brazil plays, chorizo croquetas when Spain plays and Dukkochi (Korean chicken skewers) when South Korea plays and many more. Plus all the games will be on in the pub on the big screen. "Kome, currently the resident kitchen at the Star of King’s in King’s Cross, whips up LA-inspired street food. Their menu is a mash-up of cuisines that are prominent in the Los Angeles food scene, which have proved to be a huge success with punters at the Star. The Star is taking group bookings to ensure people get a table."